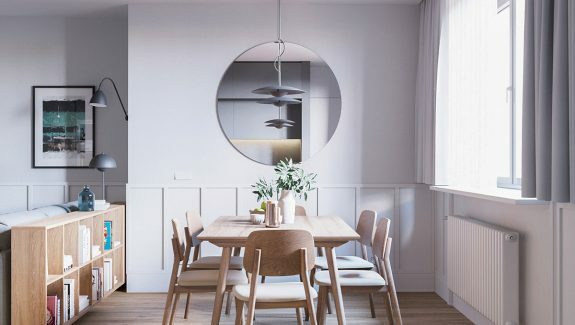 Still continuing to be vastly popular as a number one neutral for contemporary home decor is cool and calming gray but sometimes we struggle to see a way to introduce a little hint of other hues whilst maintaining the feeling of serenity. 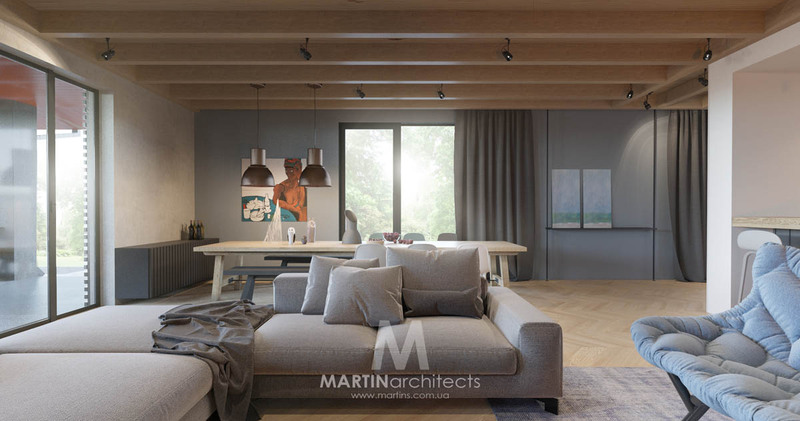 Here in this 234 square meter house in Kiev, Ukraine, by Martin Architects, a smooth living space that is populated by swathes of calming mid-tone gray leads on to beautifully subtle breaks from the monochrome tone. 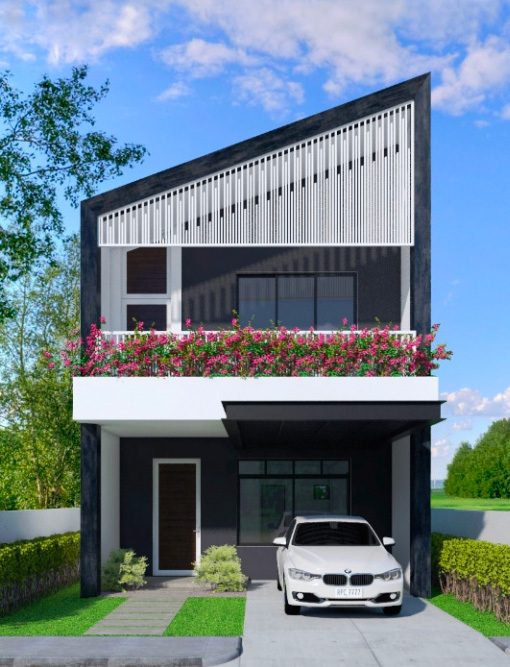 Added warmth in the interior design comes from some smooth wood ceilings and floors which are coupled with fresh pit stops of white painted walls and accent furniture throughout. 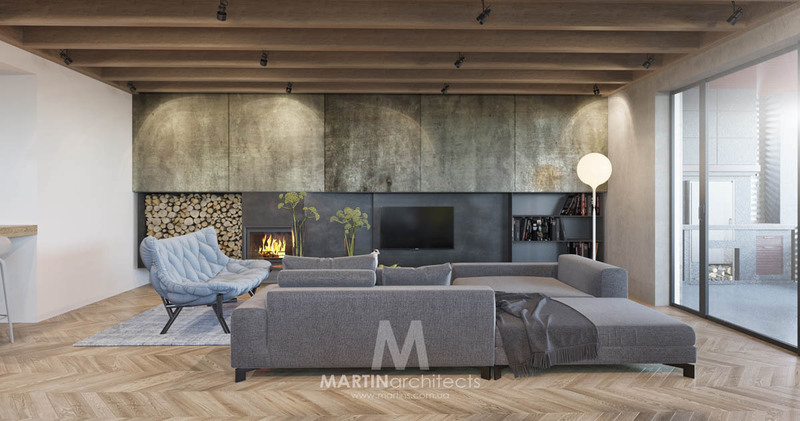 A herringbone floor adds pattern and interest to the otherwise flat wall finishes and plain upholstery fabrics and drapery. 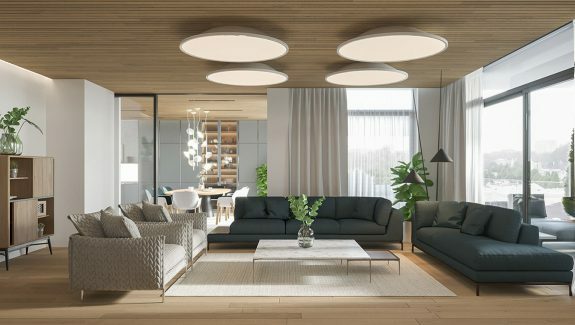 Simple track lighting and recessed spots span the large scale rooms in this apartment to ensure even illumination, but inspirational moments of mood lighting can be found in the form of modern pendants and unique wall lights. Richer tones create an eye-catching splash within the artwork beyond the dining room pendant lights. Contrasting charcoal dining benches and white chairs have been selected to create a moment of added interest. A statement settee edges away from the gray spectrum, nudging the palette toward powder blue. A log burning fire creates a cozy glow in the room, along with a globe topped unique floor lamp. 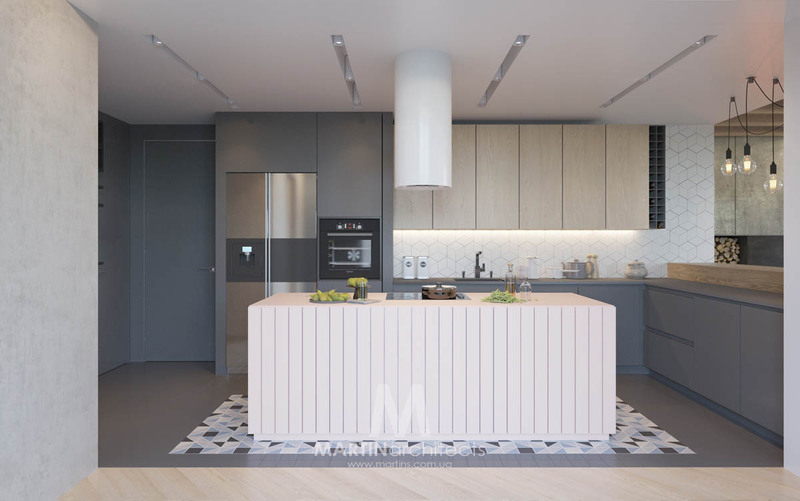 Handle-free units create a minimalistic look in the kitchen, though beautiful pauses from the plain do present themselves in the geometric floor tiles beneath the central island and also in the backsplash. 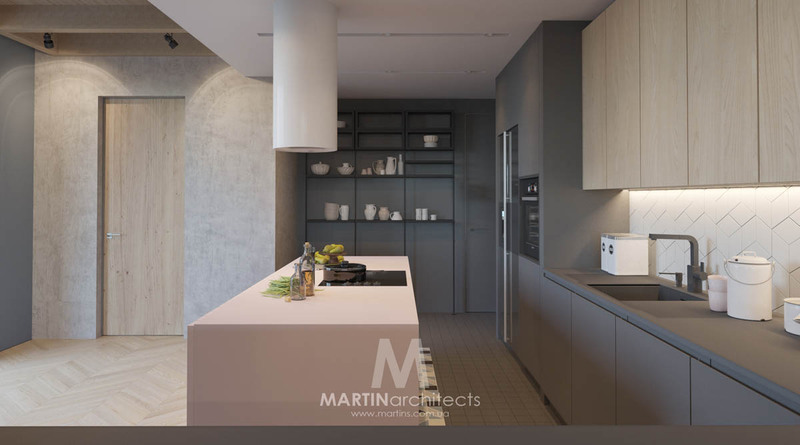 Over on one wall, exposed shelving provides an opportunity to display crockery and decorative cooking vessels. The careful selection presents almost as artifacts in a museum or art gallery. 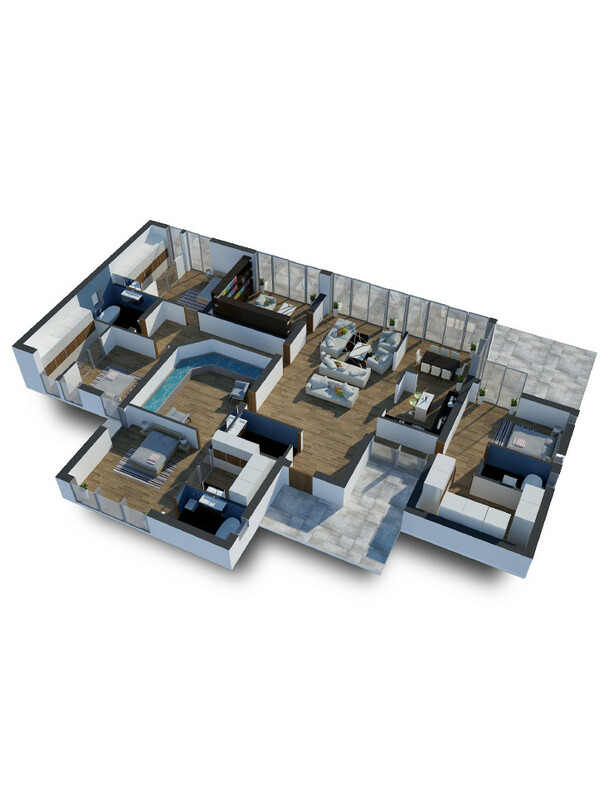 Color matched surfaces form a seamless look with the units that they top. 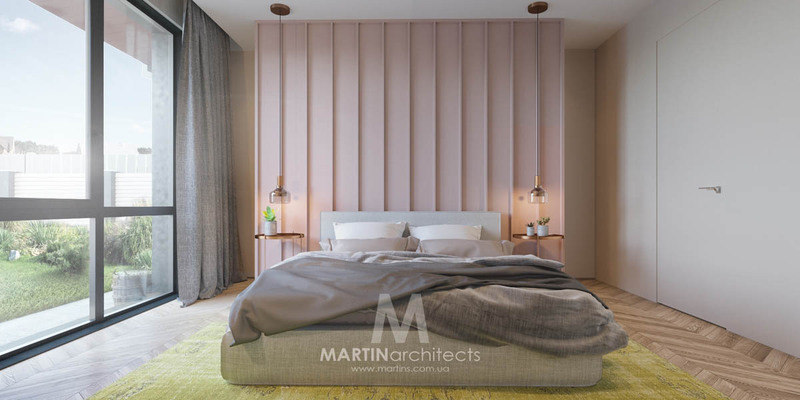 In the master bedroom, a rose-colored hint lifts the painted panel headboard wall. 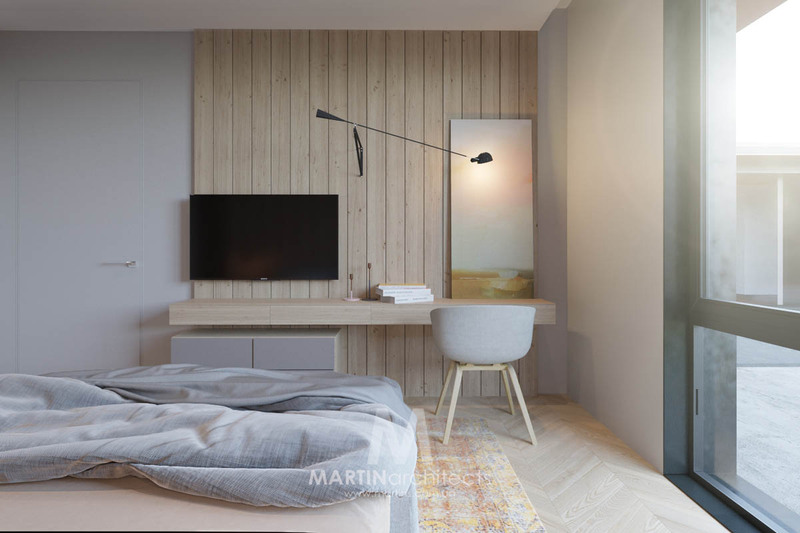 A duo of glass and copper bedroom pendant lights serve as reading lights, over two matching copper bedside tables holding concrete planters. A floating shelf of drawers serve a multipurpose as an entertainment unit and a desk. Matching both the pale wood desk top and the freestanding gray chest of drawers beneath it is a stylish desk chair design, About a Chair by HAY. A woven rug presents a little injection of cheerful color under foot. 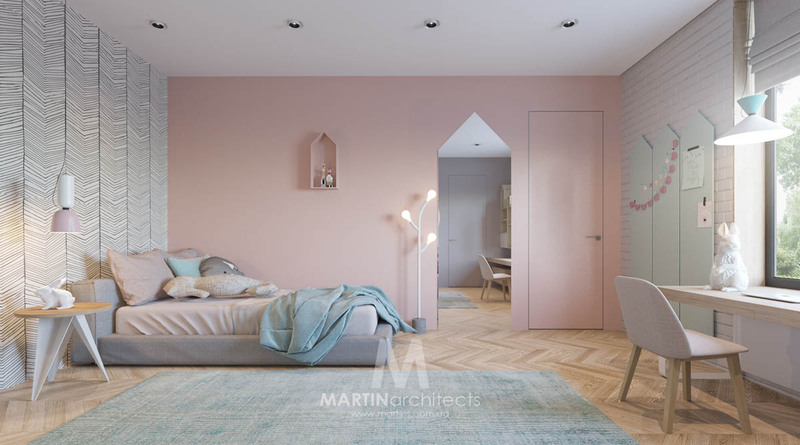 In this girl’s bedroom design, powder pink accompanies the white and gray color scheme of the home. More floating drawers form part of another desk compilation, along with an arrangement of unique wall shelves. 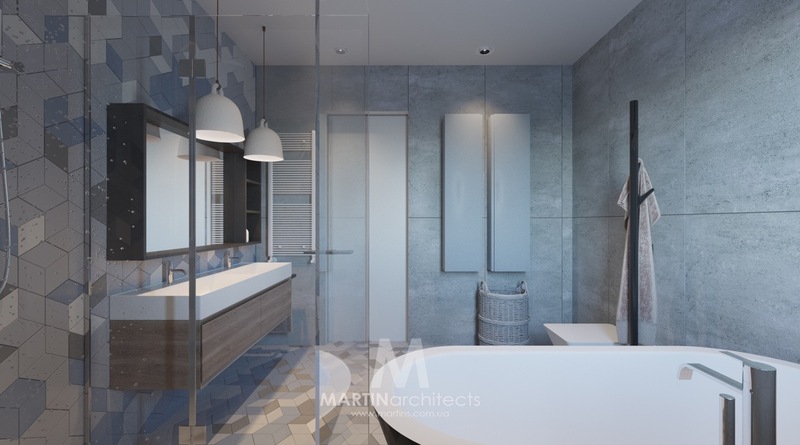 Another splash of powder blue hits this room scheme too, in a stunning yet subtle contrast with the gentle pink. 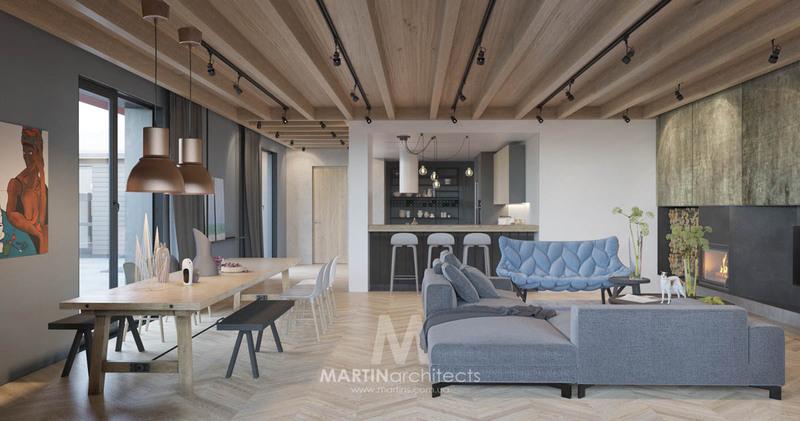 A monochrome herringbone wallpaper adds a definite blast of oomph to the soft scheme as well as giving a nod not only to the herringbone wood floor but to the pitched shape of the bedroom door, wall shelves, memo board and triangular legs of the stylish side table. A fun typographical piece adorns one wall on an unusual circular mount that is echoed by the round scatter cushions on the seating below. 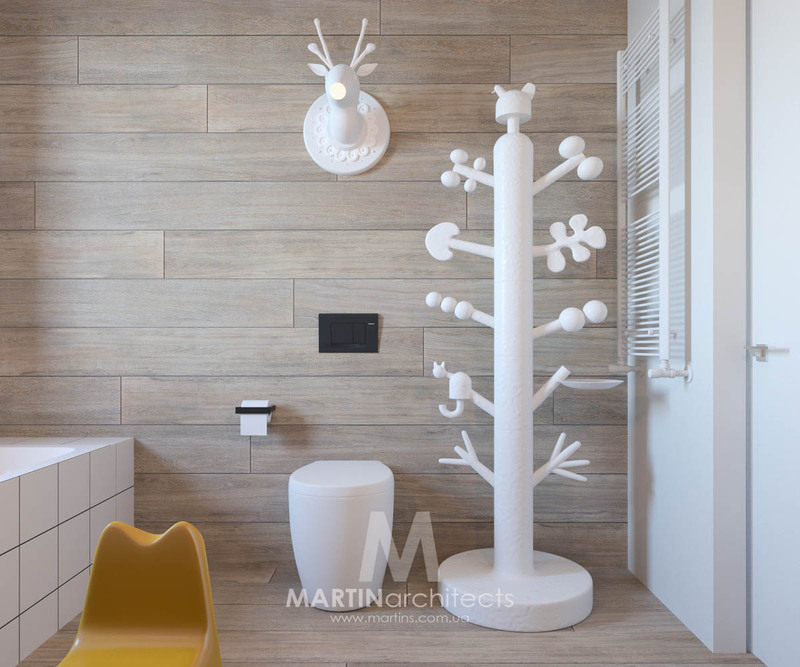 The child’s bathroom is adorned with furniture fit for a fairy tale: curiously shaped decorative hooks and a magical faux deer head wall lamp that is akin to a snow covered rudolf! 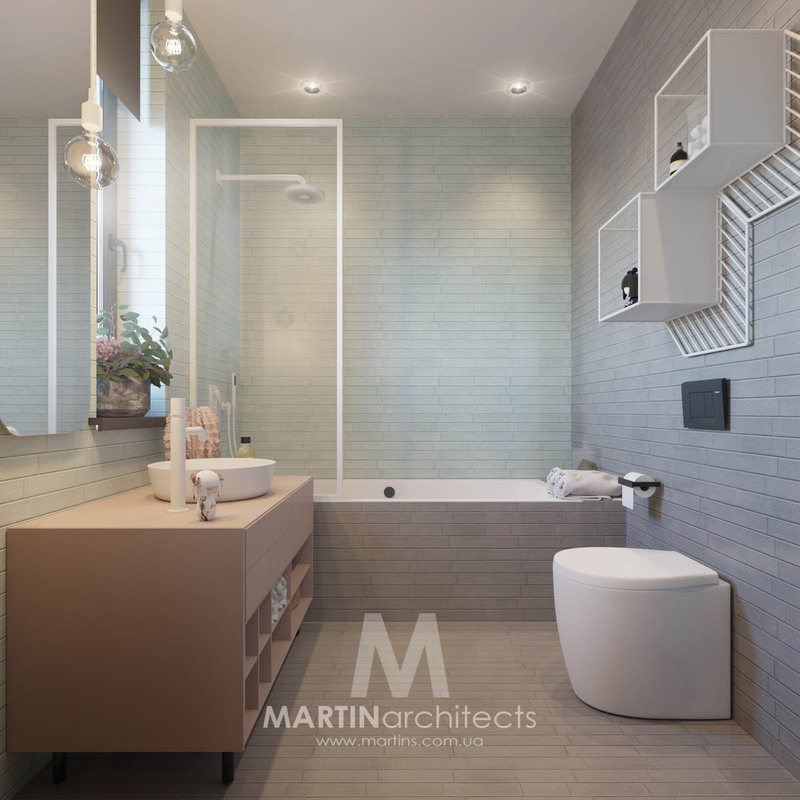 In this bathroom there is an unexpected break from the somewhat understated decor that covers most of this home. 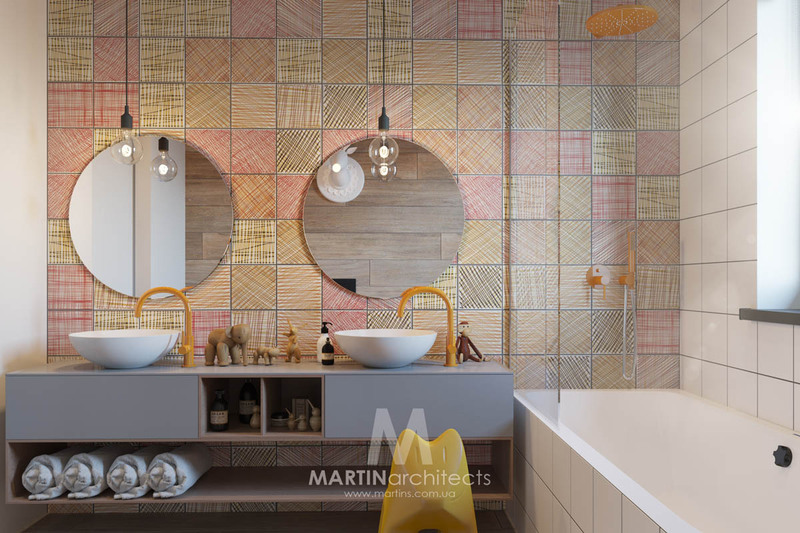 Here in this child-friendly design we find a wall of busy crosshatch pattern behind the set of twin basins, resulting in a much more energised environment. 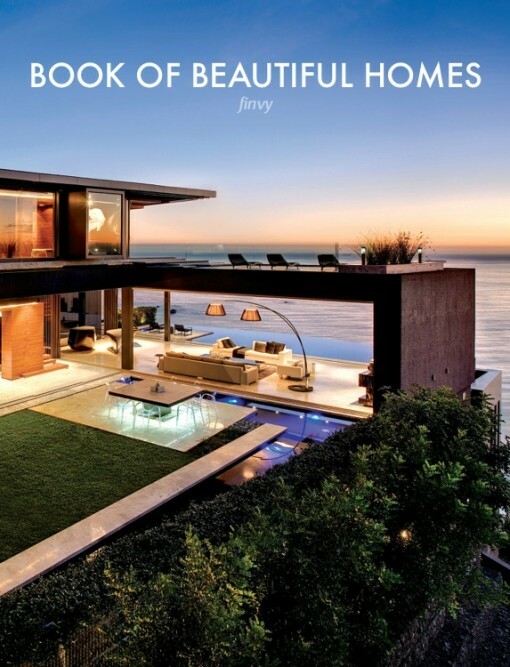 On the countertop there is a whimsical collection of animal figurines scattered between bright yellow faucets. The sunshine accents pick out tones from the tiled feature wall and are matched by a child’s novelty seat. In the next kid’s decor scheme we find more tones of yellow in the area rug and painted on the wall between the bed posts and matching framing around the feature wall. 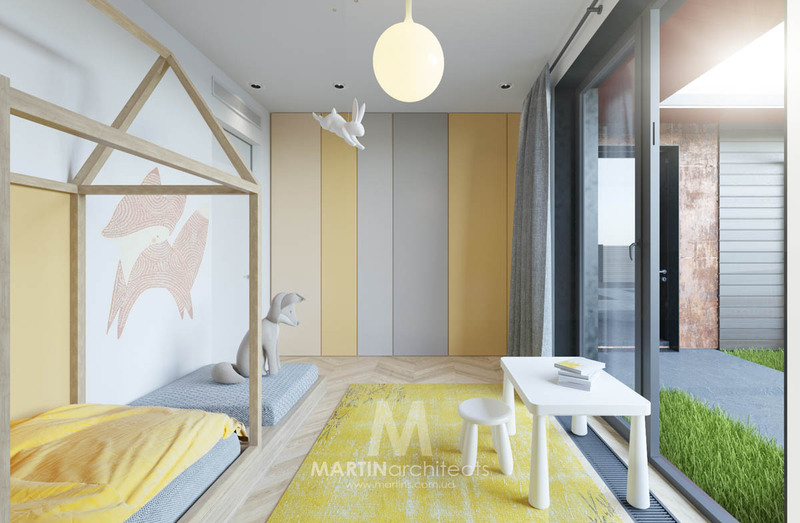 Kids’ beds come in many shapes and designs and the house frame shape seen here still proves to be a popular one. 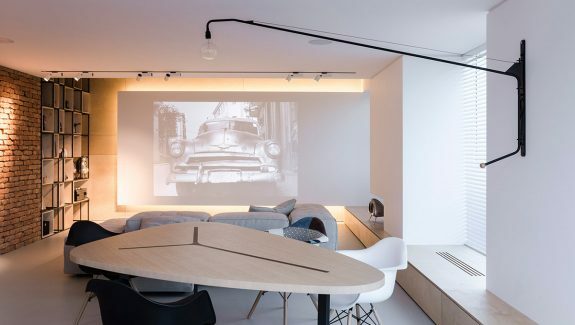 Exposed bulb pendant lighting has been wrapped around the overhead beam to provide a well placed reading light. Fox wall decals create a woodland theme, as does the leaping rabbit ceiling mobile. 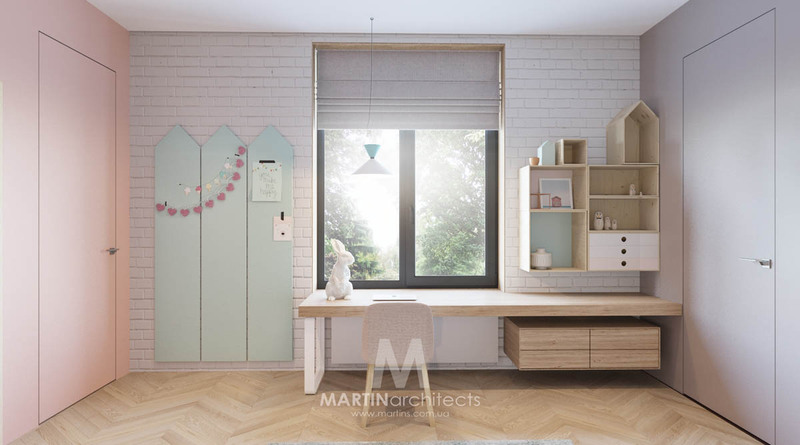 The child’s room is kept tidy with hidden storage across one whole wall, in addition to the underbed storage drawers. 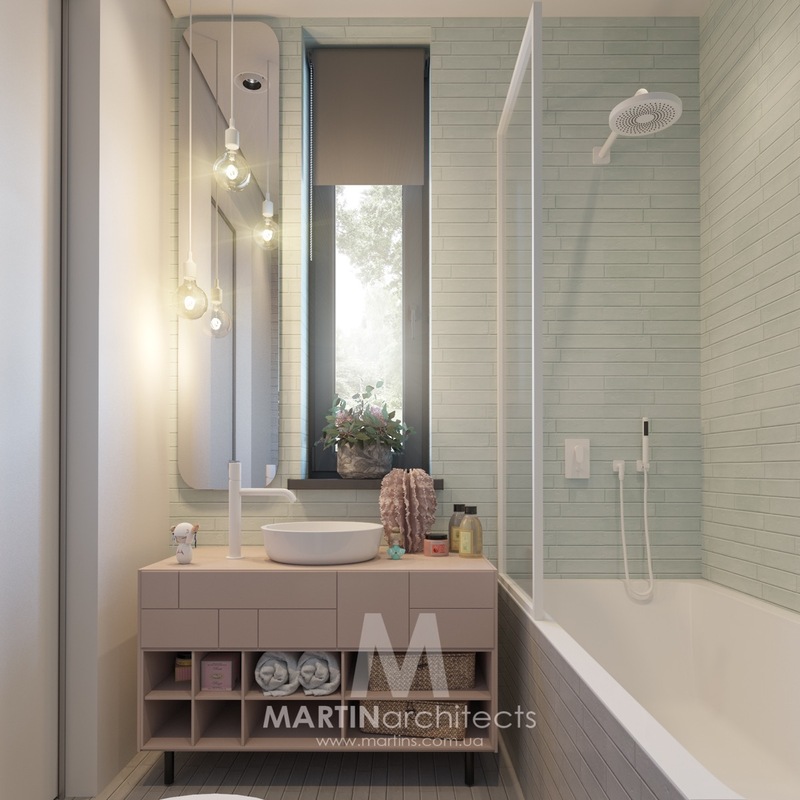 The master bathroom is a more sophisticated affair where we seat a repetition of the rose hue used in the neighbouring master bedroom. The unique wall sconce competes for attention with a wall mounted dinosaur bust in the this child’s bedroom. 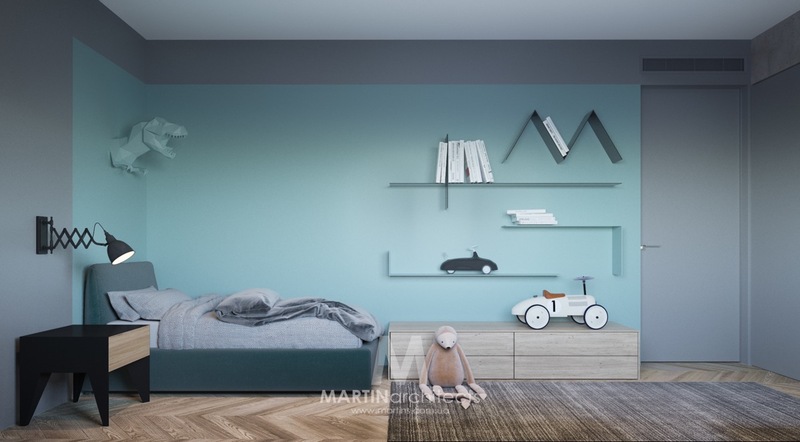 Floating shelves hold books and toys for both practical storage and decorative display. 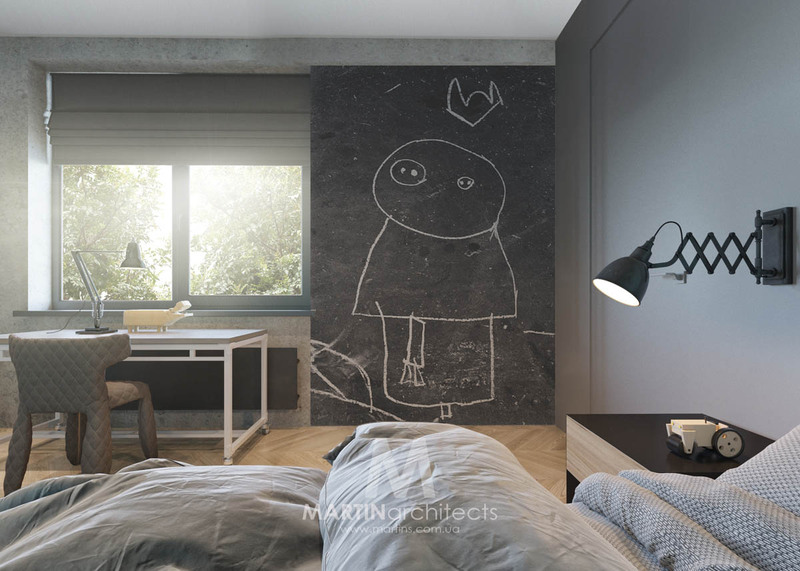 A chalkboard provides a place for creativity beside a desk. 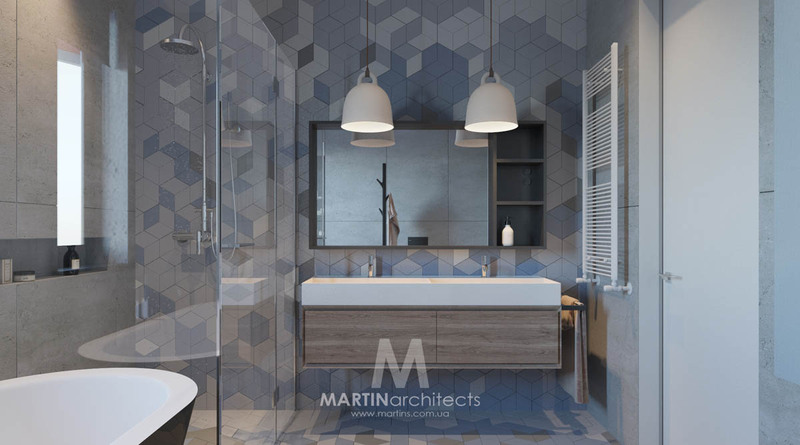 A fantastic blue toned geometric feature wall and floor stylishly dominate this modern bathroom. Bell pendants, by Normann Copenhagen, light the double basin. 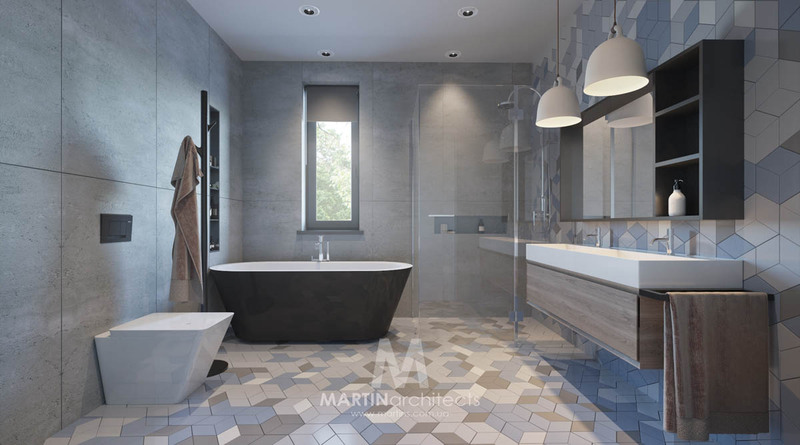 A black bath tub anchors the cool color scheme. 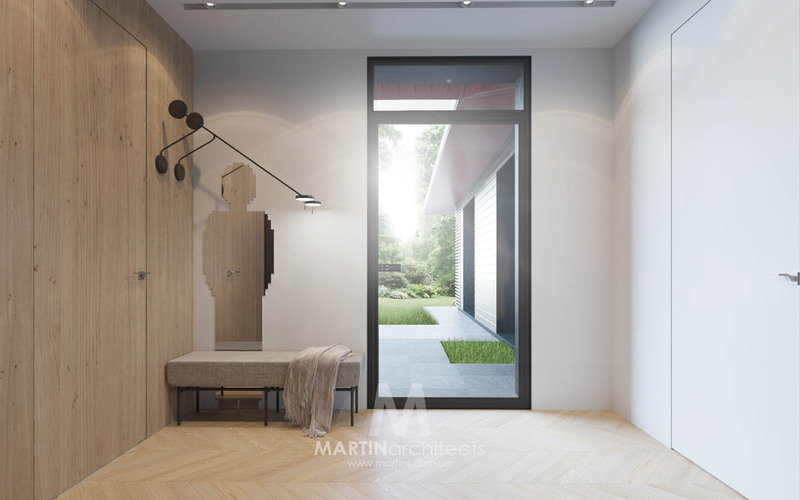 First impressions count and this smart entryway instantly sets the tone for the contemporary apartment. 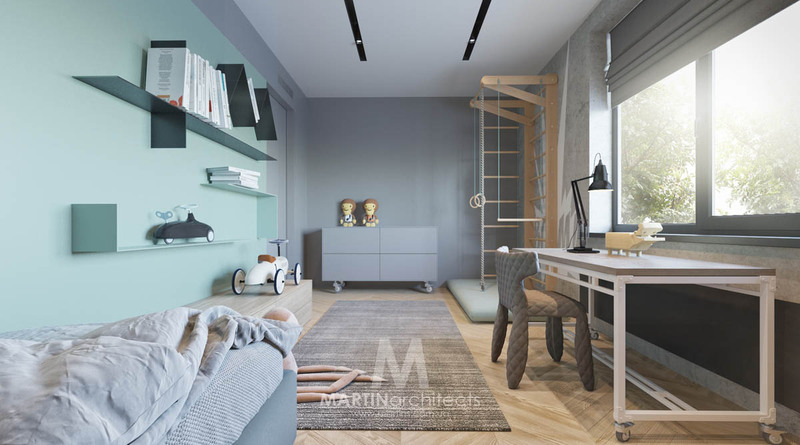 Two cool wall lights light a welcome spot on which to perch on pop your shoes on or off. 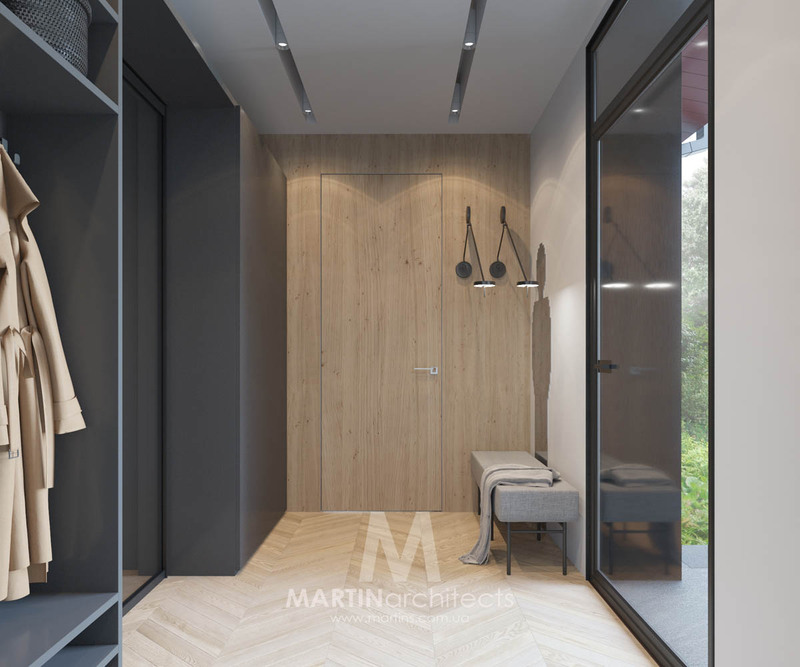 A designated hanging space holds coats and other outerwear for the family. A person shaped mirror provides a fun spot in which to check your appearance on entering and exiting the home.